RuPaul has been talking – in some way or another – about the “inner saboteur” since Season One, most infamously when he bellowed “You forgot you’re a star!” at Tammie Brown during the reunion. He has reminded countless queens in moments of self-doubt that their biggest challenge in this competition is the small but persistent voice that insists they’re not good enough. One of the keys to success on Drag Race (and in life in general) is learning to acknowledge that voice but not obey it. “Look but don’t stare,” RuPaul reminds the queens (and us) repeatedly. Few queens have struggled with this like Miz Cracker. Cracker has been shown all season producing herself and the opinions that she would like RuPaul and the judges to have of her. 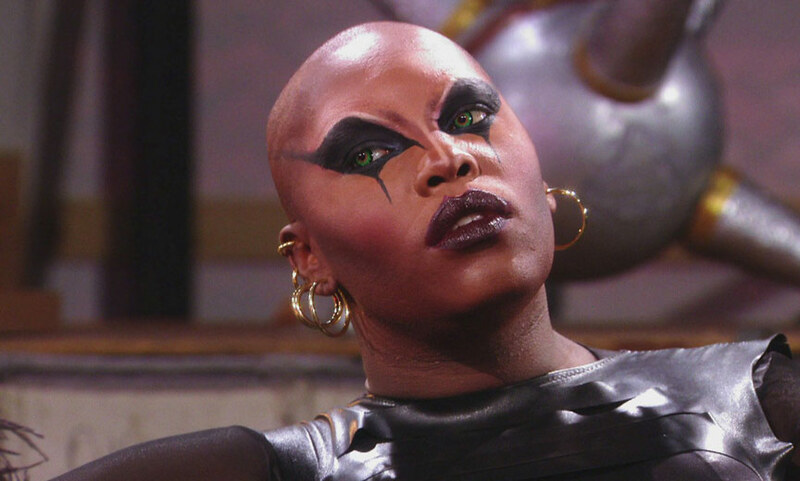 Ru has clocked her in the past for using her cleverness as a way avoid sincerity, and the other contestants have questioned her muted sense of joy. Asia O’Hara aptly pointed out that Cracker responds to a compliment or a read the exact same way, and while Cracker seems to be aware of this issue, it’s a tall order to expect a lifelong habit to change with one runway presentation. That being said, it’s not an unreasonable request of America’s Next Drag Superstar. RuPaul notes a similar challenge with Kameron Michaels; by not opening up, she prevents us from falling in love with her. This is why the judges push for vulnerability every season; that’s the skeleton key that unlocks everything in Ru’s eyes. Vulnerability is strength, it creates a sense of empathy and relatability, and from a purely competitive standpoint, being vulnerable makes people want to cheer for you. The most successful runways this week were from Asia O’Hara and Aquaria, and either queen could have won this challenge. Asia’s age and maturity were a huge asset. There was little doubt that she’d turn out an exciting runway; both her Creamsicle dream and her noir North Korea were fully realized, down to that nuanced balloon story, but it was her ability to dig into her deepest insecurities and unabashedly share them on stage that elevated her to the top. Aquaria was set up as the myopic Millennial who hasn’t developed skills of self-inquiry, but her runways all season have been proof positive that, despite being tongue-tied in the workroom, she actually has a lot of intelligent things to express. Aquaria’s success this season has hinged on her ability to read the room and adjust. She may have gotten in her feelings after Eureka and Kameron were both saved two weeks ago, but she was able to recalibrate the next morning, own up to her own selfishness, and actually course correct her behavior. She has gone from feeling like one of the most isolated queens in the room one of the most endearing. That kind of adaptability — paired with her willingness to embrace her flaws — served her in this challenge. Her lack of experience may have yielded less material for her evil couture cavewoman Sabatina, but her ability to tell a visual story in compelling detail more than made up for it. Kameron and Cracker’s bottom two lip sync felt inevitable, but considering their track records this season, we expected Cracker to cinch the save. Her kitchen sink approach to Vanity 6’s “Nasty Girl” was reminiscent of New York sister Monet X Change’s fire sale of stunts in last week’s lip sync. Meanwhile, Kameron delivered a slow burn that synced up perfectly with the song; as usual, she showed a cool confidence on stage, which not only earned a spot in the Top Four but also put her in the select circle of queens who have survive three lip syncs. Aquaria is now the last of the five New York queens standing, but she is also the current frontrunner with three challenge wins. She could potentially go through this entire season without lip syncing — like past winners Tyra Sanchez, Bianca Del Rio and Violet Chachki. However, an eleventh hour lip sync can also help propel a queen to the top: Jinkx Monsoon going up against Detox for a spot in the top three of Season Five ended up being one of the best moments of the season. So, while we’re not cheering for Aquaria to falter next week, we have spent all season excited to see what she’ll come up with next. Showing that kind of ingenuity in a Lip Sync for Your Life could be just what Aquaria needs to capture the crown. Want to queen out each week on Season 10 with us? Alright Mary is a weekly recap podcast and deep dive into all things RuPaul’s Drag Race. We go in on the queens, behind the scenes, the larger social themes explored on the show and as much reddit T as we can get our mitts on. Subscribe on iTunes and follow us on Twitter @alrightmary!